Last week I started texting friends about where they might source organic turkeys for a Thursday afternoon gorging on Thanksgiving Day. These friends rightly pummeled me with a miscellany of suggestions local to their, well, locale, this from Burleigh and Morton counties in central North Dakota. 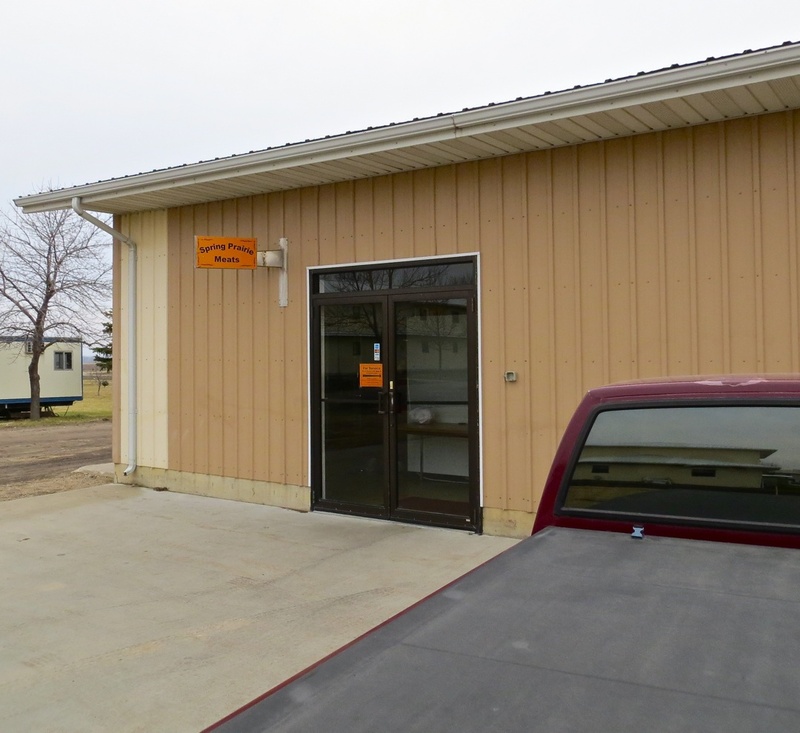 I also posted the question on social media about where folks were getting their organic turkeys, and Tom Isern (the arguable Herodotus of the Northern Great Plains) said the Spring Prairie Hutterite commune was the place to go. I should have known, since Isern has been known to distribute Spring Prairie hams around jultid. So this mid-morning I headed off to find the Spring Prairie Hutterite Colony. Below are some photos from the meat-sourcing expedition. At this intersection, turn north. 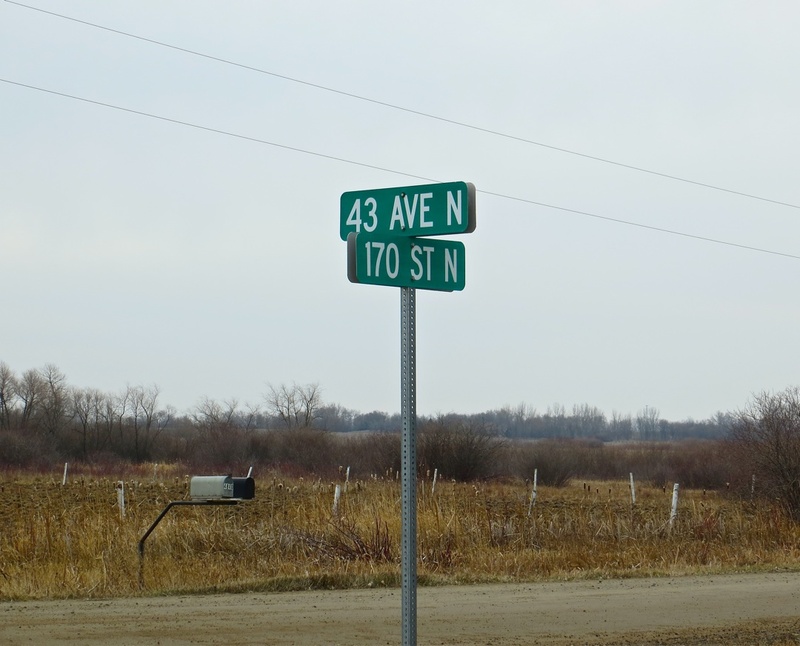 Drive that way for 1.5 miles to the entrance of the Hutterite Colony. After you hit the intersection above, point the vehicle north and drive for approximately 1.5 miles to the entrance of the Hutterite Colony. At this entrance, turn west and follow a sort-of-looking main road that arcs briefly to the southwest, and then turn west again. By this time you should have the below in view. To be sure, it is a bit nondescript, the antithesis of Robert Venturi’s lament in Learning from Las Vegas. It seems Hutterites never had to learn from Venturi or Las Vegas in the first place. Spring Prairie Meats within the Spring Prairie Hutterite Colony in Clay County, Minnesota. 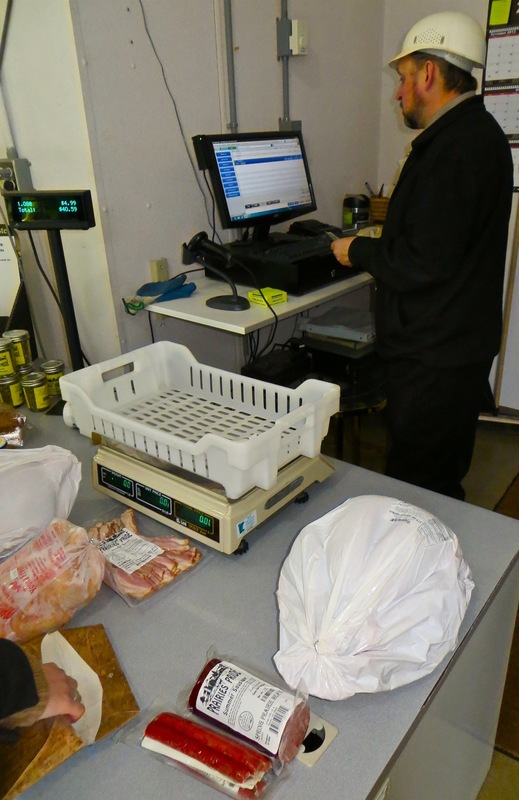 The purchase of poultry, beef and pork products at a Hutterite meat bazaar. from The American Dialect Society: Duke University Press (Vol. 70, No. 4, Winter 1995) that German language maintainence in North America results from socio-religious isolation, “the only factor which retains full force.” When you’re going over the various pork, poultry and beef products within the fridges at Spring Prairie Meats, there’s a strong chance you’ll encounter this insulated dialect, especially if unintentionally overhearing Hutterite conversation. A Hutterite man eventually asked me in English if I needed help. I responded and told him I needed a lot of help, but for now was only interested in help finding turkeys. He laughed and obliged my turkey request. I purchased a 17lb turkey for just over $1.52/pound, or right around $25. This in addition to some summer sausage and beef sticks came to around $32 and change. Not bad at all. The label of the Prairies’ Pride turkey says it is “all natural, home grown, young turkey,” and “minimally processed – no additives – no artificial ingredients – no growth hormones (Federal Regulations prohibit the use of growth hormones in poultry)” — this latter statement I was unaware of. This labeling that requires labelers to call pre-Industrial agriculture practices “natural” or “organic” is a bit silly: the majority of sedentary human history, at least up to the turn of the 19th century, was what today we’d call “organic” farming. Why not return to just calling organic farming, farming? We could then require produce produced from industrialized and mechanized means to be labeled as such: this produce was made from industrial means, and we shot a ton of antibiotics into the mammals and anhydrous ammonia in the ground to get the stuff this big. Nevermind, though. I got my natural turkey. I will be back to the Spring Prairie Hutterite Colony. I’m glad they are around. Happy Thanksgiving, and happy brining. 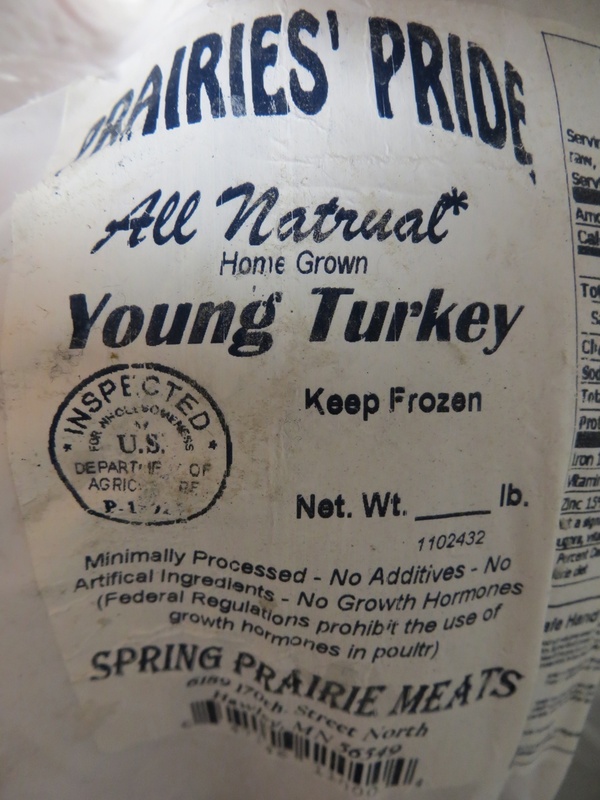 Prairie Turkey label. The brining will commence within days. This entry was posted on Saturday, November 17th, 2012 at 6:45 pm	and posted in Uncategorized. You can follow any responses to this entry through the RSS 2.0 feed. I believe that they also have the best Minnesota Honey I have ever tasted! Wonderful summer sausage also!